5 Ways IECC 2015 Affects Building Lighting Controls - Rice & Gardner Consultants, Inc.
Energy conservation is an important aspect of building design in today’s society. In the U.S. alone, the operation of buildings accounts for more than 40% of energy consumption. As a result, the International Energy Conservation Code (IECC) 2015, a residential and commercial building energy code, has been adopted by many states and regions in the United States. Energy codes and standards set minimum efficiency requirements for new and renovated buildings, assuring reductions in consumption of energy and emissions over the life of the building. Buildings constructed by following the IECC have proven to be more comfortable, affordable, energy saving, and environmentally friendly. One major piece of this is specific constraints for lighting controls. Energy used for lighting represents a disproportionately large share of building energy consumption. Use of lighting controls can eliminate 60% or more of the wasted lighting energy in buildings. The most recent cycle of the International Energy Conservation Code (IECC), IECC 2015, contains dramatic changes to the prescriptive and execution based criteria that beforehand characterized IECC-consistent lighting and lighting control systems. The greatest changes to the lighting control prerequisites are lessening lighting energy when sunshine is available, determining advanced lighting controls system intended to amplify productivity and minimize waste, and providing documentation that shows the lighting control system performs as intended. 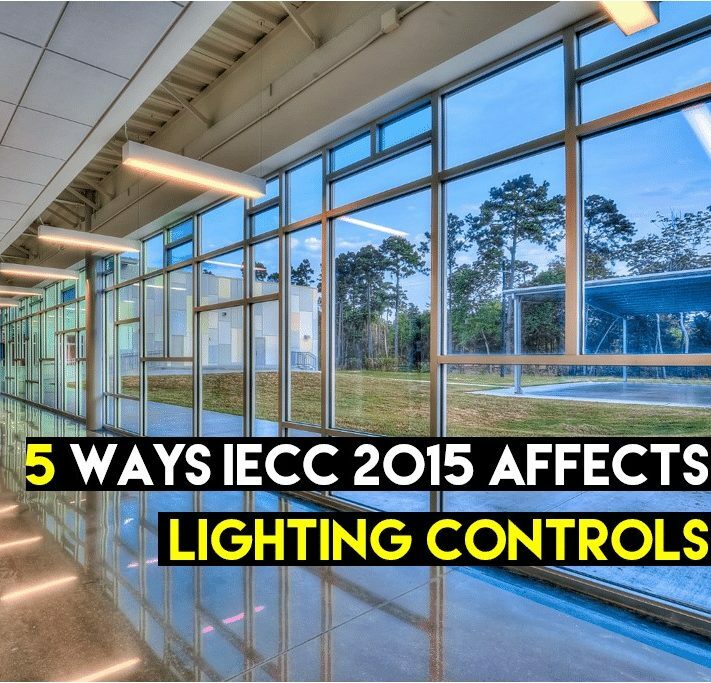 Read on to find out more about the 5 latest lighting controls required by IECC 2015! IECC 2015 has redefined daylighting controls as sunshine responsive controls. This system gives programmed control of electric light levels depending on the measure of sunlight in a space, and requires these programmed sunshine responsive controls in side lighted and top lighted zones that contain no less than 150W of associated lighting. The daylighted zone has additionally been redefined to more straightforwardly relate to the arrangement of windows, doors and other building openings. What’s more, the new code diverts the way in which side lighted daylight zones ought to be controlled, with some exceptions: zones facing different cardinal directions (N, E, S, and W) should now be controlled independently. IECC 2015 now outlines specific spaces where automatic daylight-responsive controlling systems must be combined with continuous dimming rather than allowing immediate dimming or other ways to maintain light level reduction in a space. In offices, library reading rooms, classrooms, and laboratories, daylight-responsive controls shall dim from full light output to less than 15%. For some time, energy standards have required automatic controls to guarantee that inside lights are off around evening time when the building is vacant. IECC 2015 is now incorporating outside lighting in those energy saving efforts. Outside lighting that isn’t façade or scene lighting must naturally decrease its peak power control by no less than 30 percent one hour after business shutting to one hour before business opening, or when no action has been identified in the region for longer than 15 minutes. IECC 2015 has modified and extended the alternatives accessible to meet required Section C406 Additional Energy Package Options. The extended rundown now incorporates two decisions concentrated on lighting effectiveness: planning a system with bring down lighting power remittances, or indicating a computerized lighting control framework that will give consistent darkening and individual addressability of the lights and apparatuses. The lighting controls offer a suitable option for meeting stricter lighting output. IECC 2015 requires that development records ensuring the introduced lighting controls meet reported execution criteria are to be given to the building proprietor within 90 days of the date of receipt of the endorsement of occupancy. For more information on incorporating 2015 IECC lighting controls into your next project, commissioning to bring your existing controls up to standard, or any other IECC questions, contact one of Rice & Gardner’s experts today!